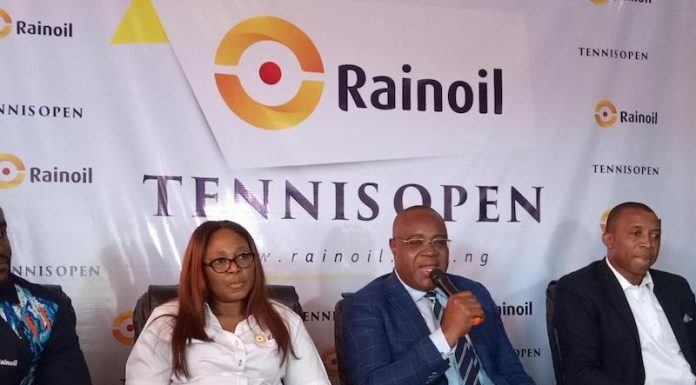 The 2018 Rainoil Open Tennis Tournament is to serve off on November 8 at the Tennis Section of Ikoyi Club 1938. Speaking at the press briefing to herald the tournament in Lagos yesterday, Group Managing Director of Rainoil, Mr Gabriel Ogbechie said that over 180 players are expected to feature in the weeklong tennis fiesta. He said the tournament was made an open one in order to add value to it and allow more top quality players to be involved. â€œThe previous format of Tennis Masters was restrictive. It was meant for only the top eight male and top eight female players on the Nigeria Tennis Federation ranking. â€œBut since last year we decided to open it up. This year we are expecting the top 64 male players as well as the top 32 female players on the NTF ranking to take part in it,â€ stressed the Rainoil CEO who was accompanied to the media briefing by top executives of the oil and gas company. Mr Ogbechie stressed further why Rainoil has been sponsoring tennis in the past 10 years. â€œWe are very passionate about tennis in Rainoil which is why we have been sponsoring this tournament for ten years now. â€œAs a person I have played tennis since I was a child. I know that tennis is one game to encourage our young boys and girls to earn decent living for themselves. Ogbechie recalled some of the leading tennis tournament in the country that used to attract worldâ€™s top players. â€œOur plan is to make this tournament an international tennis tournament where people will come from around the world to earn good money. â€œIn the past Nigeria used to have the Ogbe Hard Court, the Lord Rummens Classics, the Dala Tournament and several others where some of the best players in the world used to come and play. â€œWe are hoping that Rainoil Tennis Tournament will return Nigeria to global tennis map. Organisers of the tournament have assured all participating players of free accommodation, feeding and daily allowances. Henry Atseye won the menâ€™s singles title last year while Sarah Adegoke was the womenâ€™s singles champion. Over N5million is at stake as prize money for the 2018 edition in which the menâ€™s champion will smile home with N500,000.